Bring Out the Best in People—and Keep Them! How to Reduce Employee Turnover by 25%! Hiring People You Want ... and Getting What You Expect! Managers free their time for more important tasks! This interactive presentation describes realistic ways for participants to achieve similar results. 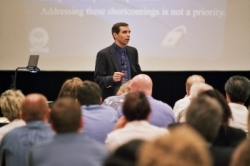 Attendees learn how to develop the untapped character qualities in their employees and more. Character qualities like dependability, sensitivity and thoroughness encompass more than ethics ... they are inner traits that produce tangible results! Employees today want more from their jobs than just a paycheck—they want inspiring and dependable leadership. Few managers were born as natural leaders. What healthcare managers lack in leadership skills, costs facilities thousands of dollars every month from uninspired employees and needless turnover. This session focuses on developing skill sets so attendees become more effective leaders. Character-based leadership skills helps all managers, regardless of current performance, reach the next level. Healthcare executives and managers love this presentation because they get significant yet simple solutions for some of their toughest workforce challenges! Employees want genuine appreciation for the good they do and constructive feedback on how to improve. With skilled labor so hard to find and costly to replace, more and more healthcare managers are learning about constructive criticism and how to develop the untapped potential in their staff. Managers who develop this skill stand out as leaders. Employee turnover has a subtle but dramatic impact on the bottom line. The costs associated with employee turnover run from $800 for a low-wage employee, to over $5000 for "the average employee" according to numerous workforce studies. Even though employee turnover is so costly, most healthcare managers receive little training in employee retention. This presentation gives managers proven methods for dramatically reducing employee turnover. Addressing employee turnover is the most effective way to overcome recruitment challenges. This hands-on workshop teaches a fresh approach to a common struggle for healthcare managers: hiring people you want ... and getting what you expect! Learn proven methods to address one of your biggest workforce headaches. Use an innovative (and simple) recruitment strategy that cuts employee turnover in half (audiences sigh in relief when they hear it)! The corporate scandals and leadership breakdown of recent years, now affects employee trust, business relationships, company profits and the economy. Integrity in the workplace is no longer assumed. Conscientious executives are taking the lead and are reinforcing integrity and values in the workplace. This interactive presentation helps executives build trust. Attendees get helpful advice on how to remain competitive despite ethical pressures from competitors and customers.